Vous pouvez également utiliser 52800 Kobo Super Points pour l'obtenir ! 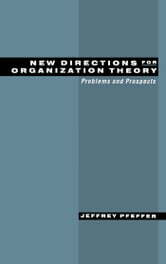 In New Directions for Organization Theory, Jeffrey Pfeffer offers a comprehensive analysis and overview of the field of organization theory and its research literature. This work traces the evolution of organization studies, particularly its more recent history, and highlights the principle concepts and controversies characterizing the study of organizations. Pfeffer argues that the world of organizations has changed in several important ways, including the increasing externalization of employment and the growing use of contingent workers; the changing size distribution of organizations, with a larger proportion of smaller organizations; the increasing influence of external capital markets on organizational decision-making and a concomitant decrease in managerial autonomy; and increasing salary inequality within organizations in the US compared both to the past and to other industrialized nations. These changes and their public policy implications make it especially important to understand organizations as social entities. But Pfeffer questions whether the research literature of organization studies has either addressed these changes and their causes or made much of a contribution to the discussion of public policy. New Directions for Organization Theory provides a clear, accessible summary of the current state of organization studies, skillfully synthesizing diverse research and presenting it in an orderly, insightful manner. It offers suggestions for the development of the field, including a call to focus more on issues of design and to use the ability to understand real phenomena to help distinguish among theoretical approaches. 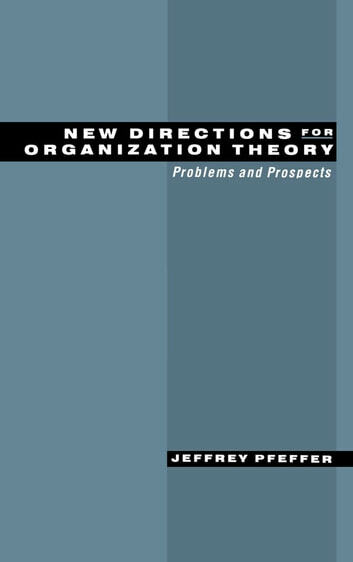 A major scholar in the field of organization theory, Jeffrey Pfeffer offers a perspective on its current state that will be of interest and value to scholars and graduate students interested in organizations.